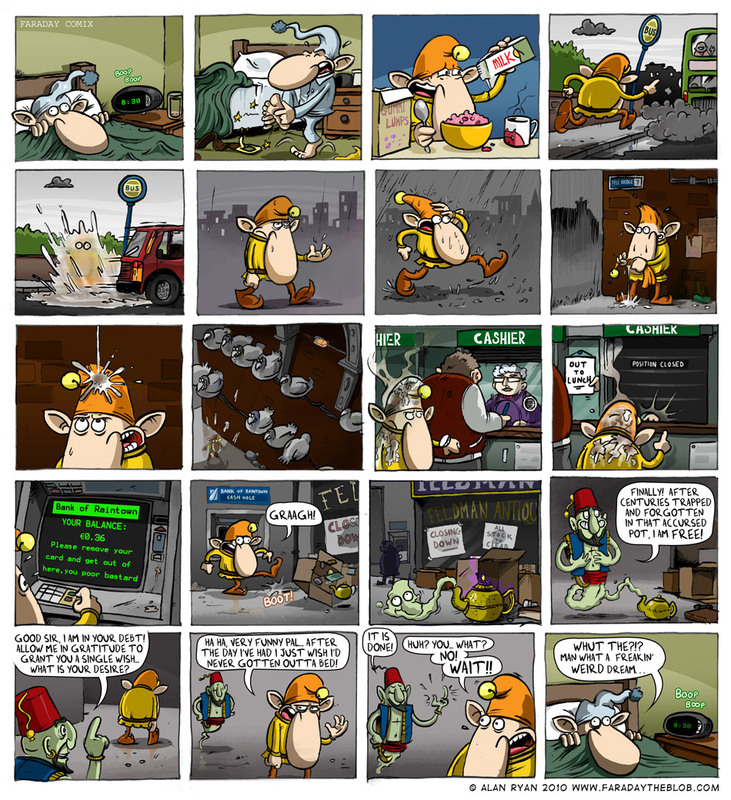 This entry was posted on Friday, July 9th, 2010 at 8:00 am and is filed under Comics. You can follow any responses to this entry through the RSS 2.0 feed. You can skip to the end and leave a response. Pinging is currently not allowed. heh heh – cash hole. A new contender for my favourite Faraday strip? Yes. Excellent, and Mr Elf’s got Jedward hair!!! Whaaaaa? Faraday on a Friday? heheheh Hate when that happens..
Love the perspective in panel 10! @ Helen, don’t you mean Jedward have Mr. Elf hair? Does he have an identical twin brother by any chance?? Gummi Lumps? I know its wrong but I really want to try them..
is that an oink mug in panel 3? where can i order a ‘melancholy swine’ mug and cake carousel set? Sorry I just want to know, so wait is he stuck in a loop now? Good detail by the way.